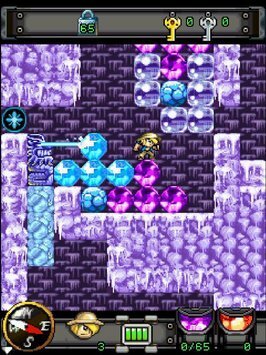 Diamond Rush is a legendary game that everyone has played on the Nokia phone. This game has officially appeared on the Android operating system, called Diamond Rush Original. Around the 2000s I could do all the housework just in exchange for an hour playing this game. This is a classic role-playing adventure game that has always won a lot of love from the players. 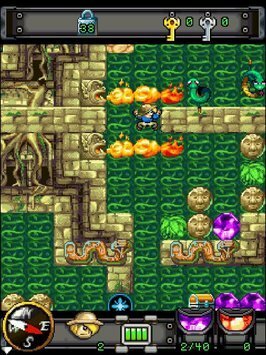 The publisher J2Game had helped many players get back to childhood when officially launched the Android version of the game on Google Play. Let’s join the dangerous adventure. Come to Diamond Rush Original, you will be playing an archaeologist who loves the mysterious expeditions in the ancient tombs. Discover and collect diamonds from world-famous landmarks such as the ancient temple of the Khmer clan, the Tibetan Snow Cave, or the Bravos. Numerous dangers are stalking you on this thorny journey. You will encounter the world’s most unique snakes and ancient traps hidden in sophistication. Use the knowledge and experience of a talented archaeologist to overcome them all. Diamond Rush Original is very simple but very addictive. It is almost unchanged from the original. Stepping into the temples, you use the navigation keys to move your character left, right, up and down. Try to eat all the diamonds that you picked up to complete the level. When playing, take precautions for all of the Diamond Rush Original Traps. Poisonous snakes, firefighting systems, giant rocks, or toxic lakes all can take your life with only negligence. In the first game, you will feel as easy as eating candy. But as the game progresses, the difficulty of the game increases. Infinite problems that the game offers you will be extremely painful to handle. I remember the game I had to play nearly 20 times to pass. The scientific roll the stone will help you solve a lot of traps. 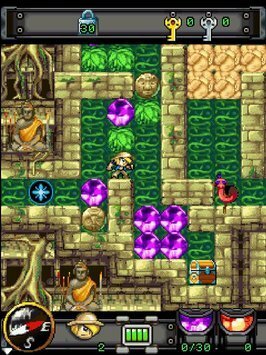 Rolling the rocks will help you block the flamethrowers to cross the road, push them to crush the snakes or simply bridle to pass. All thanks to your excellent handling of the situation. 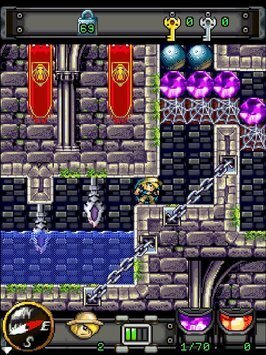 And finally, through the game, you have to pick up the key to open the gate to the next screen. Even if you eat diamonds without the key you will be stuck there forever. These keys are hidden in secret chests in every level. I advise you to open these chests early to get key or items to help you through the screen as easily as possible. Diamond Rush Original has over 40 exciting levels and hundreds of puzzles waiting to be solved. Do you want to be the greatest explorer of all time? Diamond Rush Original own classic 2D graphics. Character creation and image look childish, cute but also extremely dramatic and scary when every dangerous situation approached. When playing we can feel close, familiar but also full of new. 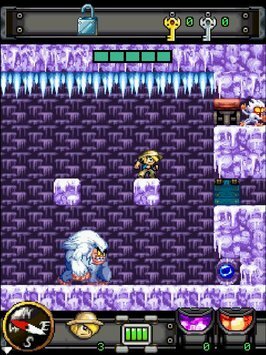 Background music is fun, automatically changing each episode in the game will make you very excited. Combined with attractive, addictive gameplay, it creates a legendary game that goes along with the years. Overall, Diamond Rush Original has enabled us to experience an old game on the new platform. Still an exciting adventure game, challenging puzzles, and familiar graphics. You can now download the original Diamond Rush game to your Android. Unfortunately, this game does not have an iOS version. Diamond Rush Original APK is ready to download! 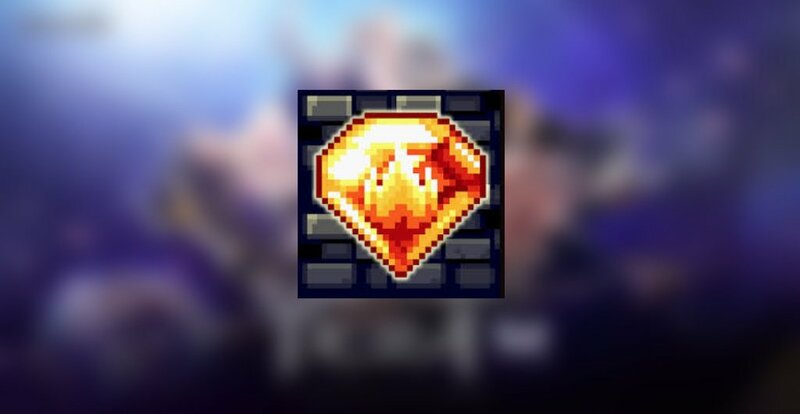 Depending on your needs, you can download Diamond Rush Original MOD APK or Diamond Rush Original Original APK. Or install from Google Play / App Store if you want.